Value Engineered! Style meets Value with this sleek and value-engineered monitor arm. The slim design complements the latest in monitor aesthetics at a competitive price. Shallow workstations are no challenge for the EDGE2 as it can be retracted to a mere 3.5" from the wall. Both Desk Clamp and Grommet Mount come standard for multiple installation applications. 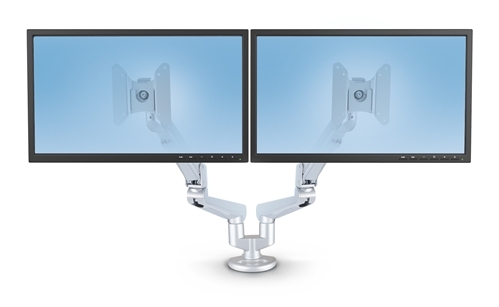 The Quick Release feature enables efficient replacement of monitors to keep user downtime at a minimum. EDGE2 comes standard in Silver finish. Black and White finish also available - please contact Customer Service at 888-632-8480 for additional information.